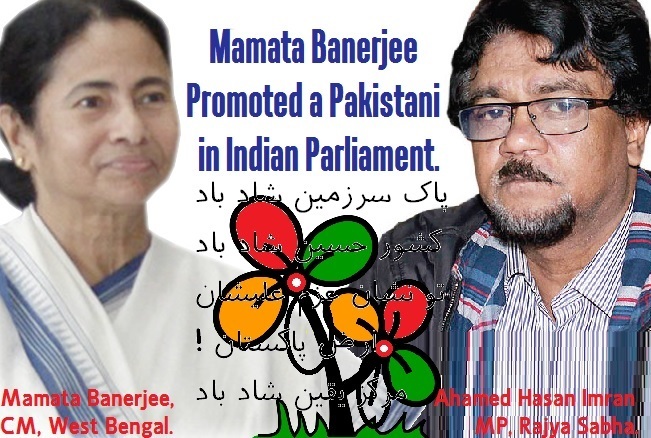 A Pakistani Jihadi is now a TMC MP in Indian Parliament! Kick him out and arrest immediately, if it is true. Why this East Pakistani citizen and International Jihad Mastermind Ahmed Hassan Imran is still roaming free in India? What is the special relation between West Bengal CM Mamata Banerjee and Imran Ahamed as he is protected in the party while Kunal Ghosh (another RS MP of TMC connected with Saradha scam) was ousted and now behind the bar?? A Chanda | NIE | Kolkata | 22 September 2014:: A Pakistani citizen is now a TMC member in the Rajya Sabha, courtesy West Bengal Chief Minister and TMC chief Mamata Banerjee. Ahmed Hassan, aka Imran, is in fact a Pakistani citizen, since he entered India from East Pakistan in 1970-71, before the birth of Bangladesh. In his affidavit before the Election Commission, he stated he passed Higher Secondary examinations in 1972 and is of 60 years old. However, he did not mention his citizenship, place and date of birth. Hassan, according to the intelligence agencies in both India and Bangladesh, was born in a village in Srihatta, Sylhet, in East Pakistan, and entered the country through its border with Assam, much before the birth of Bangladesh. Hassan first stayed in Dhubri in Assam, which has a strong Muslim population, but later shifted to Banarhat in Jalpaiguri district in North Bengal. His father, a “Razakar”, was responsible for killing a large number of Bengali intellectuals, while aiding the Pakistan Army during the Liberation War, intelligence reports mention. “He had visited the camps that were being run at Moulavi Bazar in Sylhet, in the 80s, by an ISI Major. He maintained a façade while in Assam, saying he was a Leftist, since he was settled in CPM-ruled West Bengal. But, his agenda in Assam was clear cut and to some extent, he did succeed in consolidating anti-India forces here,” it stated. Even after the organisation was banned by the Centre, he remained the face of the organisation, according to a report with the Ministry of Home Affairs. Jihadi connection of TMC explored in Saradha scam…..
Upendra Bharti | HE Media Bureau | Kolkata | 22 Sept 2014:: Ahmed Hassan alias Imran is a Pakistani National and a self-confessed SIMI co-founder (a banned extremist organisation based in India) . He is better known for multi-Billion dollar Saradha Group financial scam. In September 2014, Anandabazar Patrika, a reputed Bengali newspaper, published a series of investigative pieces, citing several domestic and foreign intelligence reports, which explored that Saradha Group helped or interalia utilized Ahmed Hassan to promote the activities of Jamaat-e-Islami-Bangladesh, a banned Bangladeshi extremist organisation, by huge money laundering out of India. Then Jamat flared up a hard agitation against Bangladesh Govt to remove Awami League from power. In this nexus, Islamic extremists from Bangladesh used to came to West Bengal in different phases to exploit the soil of West Bengal as a factory of Jihad in the contour of Mamata Banerjee’s call for Change (Parivartan). Ahmed Hassan took the advantage of Mamata Banerjee’s policy on Muslim appeasement and inner corruption of TMC and Mamata Banerjee linked with Saradha Chit Fund groups. Ahmed Hassan Imran is also a fundamental journalist who published the ‘Kalam Weekly’ at first and ‘Daily Kalam’ afterwards to promote Islamic resurgences in West Bengal for the purpose of the materialization of Pan Islamism in Bengali world. elected MP of Rajya Sabha from West Bengal, India He had sworn into the parliament on 9 June 2014. Imran helped TMC by propagating Islamic face of TMC in Daily Kalam in many ways and ensured the flow of fund for TMC in 2014 election purpose from the Saradha-Jamaat Fund from the end of Bangladesh very efficiently. Mamata Banerjee awarded a Rajya Sabha seat for his Jihadi friend Imran out of gratitude and Islamic understanding. Early life of Imran Ahamed: The Rajyasabha website does not mention Imran’s date or place of birth. According to Imran himself, he was born in the Mal police station area of Jalpaiguri district in West Bengal. He claims to be 100% Indian. However according to a report of the Indian High Commissioner in Dhaka sent to the Ministry of External Affairs, he was presumably born in East Pakistan. He infiltrated into Indian territory in 1970 or 1971 from Sylhet in present day Bangladesh. Initially he stayed in Dhubri district in Assam. Later he shifted to Dhupguri in Jalpaiguri district of West Bengal. Career: According to the report of the Ministry of External Affairs, in 1975-76 Imran founded West Bengal Muslim Students Association. The organization rapidly spread through the state. On 24 April 1977, Imran co-founded the Students Islamic Movement of India in Aligarh Muslim University in Uttar Pradesh. Imran became the president of the West Bengal unit of the organization and held the position till 1980. Even after relinquishing the position, Imran remained the primary organizer and spokesperson of the organization till it was banned in 2001. He setup the office of SIMI in a two room apartment in 19, Dargah Road in the Park Circus area of Kolkata. In 1981, he started publishing Kalom as the monthly Bengali mouthpiece of SIMI. Kalom continued to be published as a monthly till 1994. During his period SIMI spread throughout the length and breadth of West Bengal. 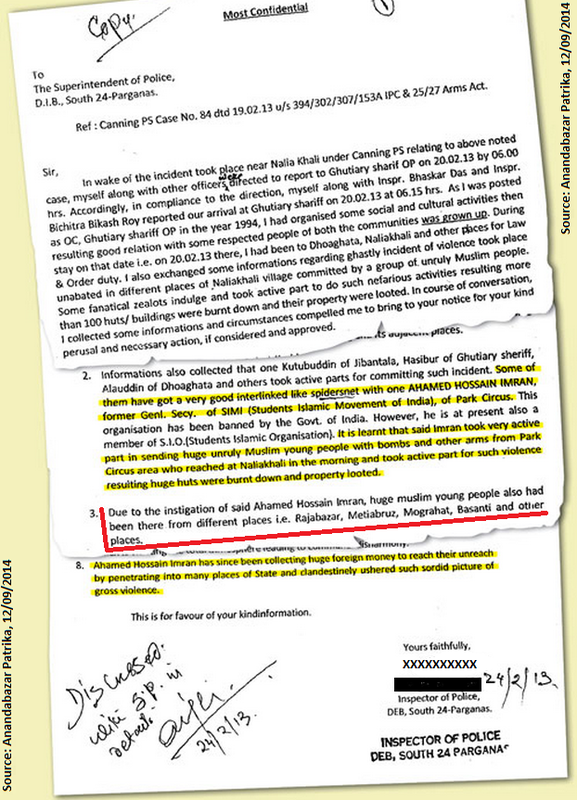 According to the report, as a result of SIMI’s growth in West Bengal, Imran became popular in the Islamist circles. He was appointed as the board member of the Jeddah based Islamic Development Bank to oversee the affairs of the eastern zone. Mamul al Azam, who is the Managing Director of Islamic Development Bank, is the son of Ghulam Azam, a convicted war criminal of Bangladesh and retired leader ofJamaat-e-Islami. According to Indian intelligence reports, Imran is very close to Mamul ul Azam. Soon after his appointment as the board member of the IDB, Imran converted Kalom into a weekly. In 1998, he converted Kalom into a daily. At this time he shifted the office of SIMI and Kalom from Park Circus to 45, Eliot Road. The erstwhile office at 19, Dargah Road became a hideout of the SIMI cadres. Apart from being the editor of Kalom, Imran also acted as the India correspondent of a Jamaat-e-Islami controlled Bengali daily named Naya Diganta published from Bangladesh. His articles were published regularly in Naya Diganta. He also acted as the news gatherer for Bengali division of Radio Tehran. In 2011, he sold Kalom to Sudipta Sen, the CEO of Saradha Group. Allegations of anti-national activities: Links with Jamaat-e-Islami: During the 2014 general elections, Gautam Deb, the former Housing Minister of West Bengal, quoting from a secret report, alleged that Imran was a front man of the Jamaat-e-Islami-Bangladesh. Deb further alleged that Imran maintained close association with many top ranking Jamaat-e-Islami leaders. Imran denied all the allegations and contemplated legal action against Deb. According to a Ministry of External Affairs report, Imran had direct connection with Jamaat-e-Islami leaders like Ghulam Azam, Motiur Rahman Nizami, Delwar Hossain Sayedee, Ali Ahsan Mohammad Mojaheed, Mir Quasem Ali and Abdul Quader Mollah. Many of these leaders are either accused or convicted of genocide of the Bengali Hindus during the Bangladesh Liberation War. According to an Indian intelligence report, Imran and one Maulana Asif Khan had channeled huge amounts of money to Jamaat-e-Islami and BNP in 2014. According to Bangladesh based human rights activist Shahriyar Kabir, Imran has close connections with Jamaat-e-Islami. Imran has denied any connection with the Jamaat-e-Islami and maintains that he left SIMI in 1984. Secret reports suggest that Imran Ahamed has a close connection with Baduruddin Azmal of AIUDF, Azam Khan of SP and Owaisi Brothers of AIMIM. These leaders are notorious for their fundamental and subversive politics. Anti Taslima Kolkata riots 2007: According to Indian Intelligence Bureau reports, Imran along with Idris Ali and Nurar Rehman Barkati of Tipu Sultn Mosque played a major role in the violent riots in Kolkata on 21 November 2007. People under the banner of All India Minority Forum blockaded major part of the central Kolkata and resorted to arson and violence in their plea to evict exiled Bangladeshi writer Taslima Nasrin from West Bengal. Canning riots 2013: According to report of the South 24 Parganas district Intelligence Bureau send to the West Bengal Home Department, Ahmed Hassan Imran was directly involved in the Canning riots in 2013. The report stated that on 21 February 2013, Imran sent large numbers of Muslim youths armed with bombs and other arms from Park Circus to Naliakhali. He also sent armed youths from Muslim dominated Rajabazar and Metiabruz of Kolkata and Magrahat and Basanti of South 24 Parganas district to Naliakhali. The armed youths looted and set fire to around 300 houses in the mayhem place of Naliakhani under Canning Police Station. Muslim hooligans also molested Hindu girls and women and rushed a reputed athlete for satiating their Islamic appetite. In the evening he convened a meeting with several Muslim leaders in a five star hotel in Kolkata, where he shared how he had organized the violence and how he would control the area in future. Investigations: In Bangladesh: According to Indian Home Ministry report, the Bangladesh government has blocked the visa of Ahmed Hassan. The Bangladesh government has formed a committee to investigate the channeling of Saradha’s funds to Jamaat-e-Islami. It has started preparing a report on the Jamaat-e-Islami has utilized the funds from Saradha in the 2014 Bangladesh general elections and the relation between Jamaat-e-Islami and Ahmed Hassan Imran. In a seminar arranged by the Bangladesh government in Dhaka, the Liberation War Minister called for a join task force between India, Bangladesh and Myanmar to stop the terrorist activity of Jamaat-e-Islami. in the meanwhile a high level Delegation of Banglaadesh Govt. met their Indian counterpart to exchange their views for the arisen situation out of the exposure of terror link of Ahamed Hasan Imran with JMB, Hijbut Tharir and other fanatic faction of Bangladesh. In India: The Indian Home Ministry has directed the National Investigation Agency to work closely with the Bangladeshi counterpart to probe the link between Jamaat-e-Islami and Ahmed Hassan Imran. The National Investigation Agency has also started investigation on the connections between Jamaat-e-Islami Hind and Jamaat-e-Islami Bangladesh. Caution: Secret sources suggest that Ahamed Hasan Imran may flee from this country via Nepal-Myanmar-Pakistan route to join IS (ISIS-ISIL ) to perpetuate the un-attained goal of Islamization through Tehreek-e-Bangal. Al Qaeda and ISIS are generating their Indian module to spread their Jihadi activities in south east Asia and trans south east Asian mking its base in Indian sub-continent. Recommendation: A subversive and international terrorist mastermind Ahamed Hasan Imran must be arrested on the basis of primafacie evidences and prosecuted rigorously under appropriate law enforcement. Courtesy: NIE | Rajya Sabha Site | Wikipedia | ABP. If this type of anti national things are happening even after so called Hindu Samrat becomes PM of Bharat, then it is shame for the people who believe on peace. My vote to Narendra Modi goes waste. Not only this Imran, but also the leadress of the party to be hanged in open road crossing as she in spite of adverse report from her own police department gave this stupid the ticket of Indian Parliament, though from backdoor as she knew it very well that this person has no caliber to enter Indian Assembly/Parliament directly. Narendra Modi is the best PM of India, only few months cannot prove it, minimum time should be given to any person. His attitude, personality, style of functioning and above all life style remind us Indian Sages. Hasina to Hand over Saradha-Jamaat File to PM. KOLKATA: Bangladesh Prime Minister Sheikh Hasina will hand over a dossier to Prime Minister Narendra Modi in New York on Saturday with detailed information on how Saradha funds were channelised to Jamaat-e-Islami in Bangladesh. The two leaders are scheduled to meet after the UN meeting and discuss various issues, including the Teesta water pact and the land boundary agreement. Sources said Hasina would also provide detailed information on certain politicians from West Bengal aiding the Jamaat in its anti-government agitation and harbouring extremist elements in the state who had crossed over after committing crimes in the neighbouring country. The National Security Investigation (NSI), Dhaka’s prime intelligence agency, has compiled a file on how funds of the Saradha chit fund scam were funnelled to the country and invested in at least 10 hospitals and banks, which were linked to Islamic fundamentalist organisations. Dhaka will also provide details of how the Jamaat had helped a particular political party in West Bengal during the 2011 state Assembly elections and also during the recent Lok Sabha polls. 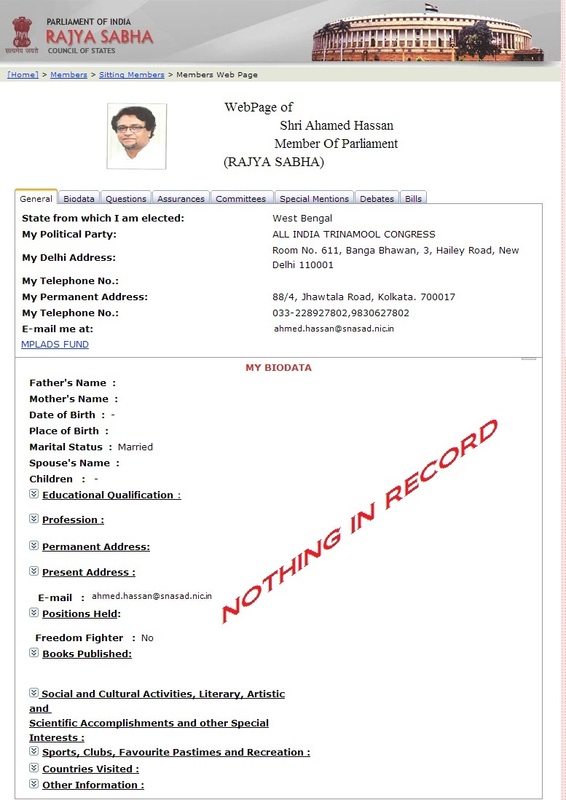 She will also furnish documentary proof on Trinamool Congress Rajya Sabha MP Ahmed Hassan aka Imran’s links with frontal organisations of Jamaat, which is banned from functioning as a mainstream political party and contest elections in Bangladesh. The Bangladeshi Government has already “blocked” Hassan’s visa to the country. Bangladesh Minister of State for Home, Asaduzzaman Khan Kamal told Express over telephone: “We are in touch with the Indian Government and passing on information as soon as we are getting them. We know about him and his activities.” sources said the NSI had collected pro-Jamaaat articles written by Hassan in a Bengali daily in Dhaka and his role in organising support for the fundamentalist organisation in West Bengal. Dhaka has collected names of politicians in West Bengal who are linked to Jamaat, details of their meetings with the Jamat leaders and how extremist elements from Bangladesh are being provided shelter mainly in the districts of North and South 24 Parganas. The Jamaat-e-Islami Bangladesh is very strong in Saatkhira district, which is just across the Ichhamati river dividing the two countries, and runs camps there to recruit youths who also infiltrate into India. Several Awami League workers have been killed by the militants. The Bangladesh Government had busted some camps in an operation against the Jamaat and many of its activists were injured. The NSI has also collected information on injured Jamaat activists, who were injured during counterinsurgency operations, were provided medical treatment in West Bengal and ambulances belonging to the Saradha Group being used for it. They were transported to private hospitals in the city and returned in the same way to the border to cross over to Saatkhira. Abdul Barik Biswas, a gold smuggler, who is the brother of a TMC panchayat samity member, was nabbed by sleuths of the Directorate of Revenue Intelligence with 44 kg of gold bars. Biswas, who hails from Basirhat in North 24 Parganas, tried to fire on the sleuths with a 9mm pistol, but was overpowered. He is said to be one of the key pointsman liaisoning between Jamaat and some politicians in West Bengal. He had helped channelise funds from Saradha Group to fundamentalist leaders in Bangladesh as he was an expert in trans-border trafficking, sources said. Bangladeshi human rights activist Shahriar Kabir, who was in the city, told Express, “Several sleeper cells of Jamaat-e-Islami Bangladesh are active in West Bengal. There are reports about Hassan’s connection with SIMI and Jamaat. “But it seems the Trinamool Congress leaders are trying to protect him. My question is why? They should not allow West Bengal soil to be used against the Awami League Government. “Our Prime Minister Sheikh Hasina has flushed out Indian insurgents like the Ulfa from Bangladesh. If Bangladeshi terror outfits are getting support from Bengal, it is dangerous. If organisations like Jamaat are allowed to spread it will pose a threat to entire South Asia,” he said. Sources in Dhaka said during the meeting with her Indian counterpart Hasina would suggest a joint machanism to fight against terrorism to Modi. The Bangladeshi Government wants frequent meetings and exchange of information between security and intelligence agencies of the two countries. This entry was posted on September 22, 2014 by hinduexistence in Breaking India, Breaking Indian National System by Muslims, Conspiracy against Hindus, Conspiracy against India, India under Islamic Aggression, Islamic Aggression in West Bengal, Islamic Menace, Islamic Terrorism, Jihad in India, Jihad in West Bengal, Save Bharat (India) from Jihad, Save India from Supremacist Islamic Conspiracy, Stop International Conspiracy against India, Stop Islamic Menace in India, Stop Islamic Terror in India and tagged Ahamed Hasan Imran behind the Canning Riot, Ahmed Hasan Imran, Ahmed Hassan Imran, Allegations of anti-national activities, Anti Taslima Kolkata riots 2007, Arrest Ahmed Hasan alias Imran, Canning-Naliakhali riots 2013, Early life of Ahamed Hasan Imran, Early life of Ahamed Hassan Imran, Election Commission of India, Jamaat-e-Islami Bangladesh, Mamata Banerjee, Mystery Surrounds Pakistan Citizen's TMC MP, Rajya Sabha, Saradha Money Laundering to BD Terrorist Orgs, TMC Pakistani MP in Indian Parliament.